Okay, lets talk CRM. The CRM news from Convergence is about the release of Microsoft Dynamics Marketing (formerly MarketingPilot), Microsoft Social Listening (formerly NetBreeze with a little Parature ebbing in) and Customer Care (a combination of Parature and organic development). Interestingly, I thought there was a fourth theme, although it didn’t really get any messaging, which is the pace of Microsoft’s CRM release frequency and how these releases line up to better compete with rival Salesforce.com. More on that at the end of this blog post. The Microsoft CRM Q2 update previously referred to as Mira is now known as Microsoft Dynamics Marketing. This release stems from the October 2012 acquisition of Marketing Pilot, and the subsequent rewrite, in order to bring much needed marketing strength to the CRM suite. The upside is that Dynamics Marketing now includes a broad Marketing Resource Management (MRM) system that caters to both digital and traditional (offline) campaigns. Very few CRM systems venture into MRM, so Microsoft is offering some relatively unique capabilities with features such as marketing budgeting, project management, resource allocation, scheduling, expense management, digital asset management, content markup and approval, brand and event management, and campaign management with some analytics. 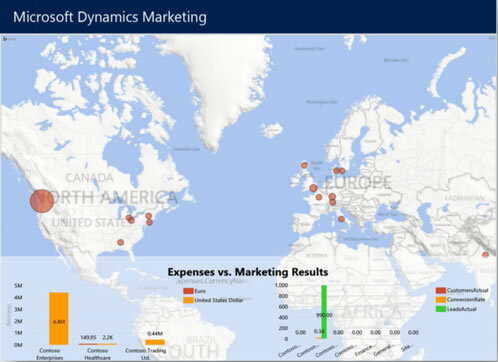 I also think Microsoft’s choice to expose Dynamics Marketing data in the Power BI inside of Excel will bring some much needed analytics to marketing budgets and campaign performance. The downside is that Dynamics Marketing is weak in the single most requested area of marketing automation. It does now include a visual campaign designer, perform some basic lead scoring and support primitive nurture campaigns, but customers seeking marketing automation for digital lead tracking, progressive lead scoring, intelligent nurture campaigns and rich lead gen analytics will need to consider other ISV marketing automation systems that work with Dynamics CRM. The Dynamics Marketing target market is also unclear. At the prior Worldwide Partner Conference, the product managers suggested the product was intended for companies with 15 or 20 or more marketers, which is fairly typical for MRM solutions. However, exceedingly few Dynamics CRM customers have 20 or more marketers, and I think Microsoft may be coming down on the intended market. Dynamics Marketing is hosted on Azure and available as an add-on service with Dynamics CRM Online, CRM on-premises or as a standalone solution. Microsoft’s choice to expose Dynamics Marketing data in the Power BI inside of Excel will bring some much needed analytics to marketing budgets and campaign performance.